Ara Najarian, Chair of the Los Angeles County Metropolitan Transportation Authority Board of Directors, joined Los Angeles County Supervisor Michael Antonovich and Metro’s CEO Art Leahy today to present Measure R sales tax money to the Palmdale City Council for use in improving transportation in the city. 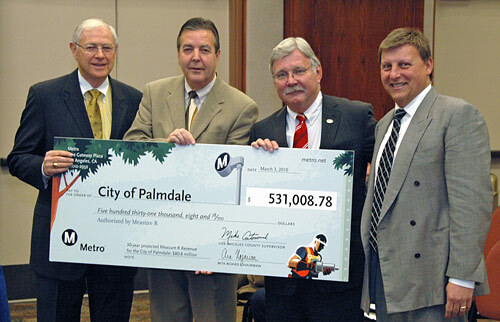 The Measure R payment to Palmdale totaled $531,008 collected from July 1 through last month. Palmdale is projected to receive $80.8 million over the 30-year span of Measure R.
Measure R, a new half-cent sales tax approved by the voters in Nov. 2008, is expected to generate approximately $40 billion over its 30-year lifespan. As part of the measure, local cities within Los Angeles County receive 15% of the funding to use for major street resurfacing, pothole repair, improving traffic congestion, bikeways, pedestrian improvements signal synchronization and transit improvements.